This is the day you’ve all been waiting for: “Dead Pet Day.” Over the years we’ve had a dog, hamsters, mice, lizards, rabbits, fish, and birds. We are now petless. I decided to keep the dog dishes for a grand-dog who visits and I kept the rat trap to prevent visiting rats from staying. I will, however, get rid of the aquarium hood for heating lizards since we no longer have the aquarium. 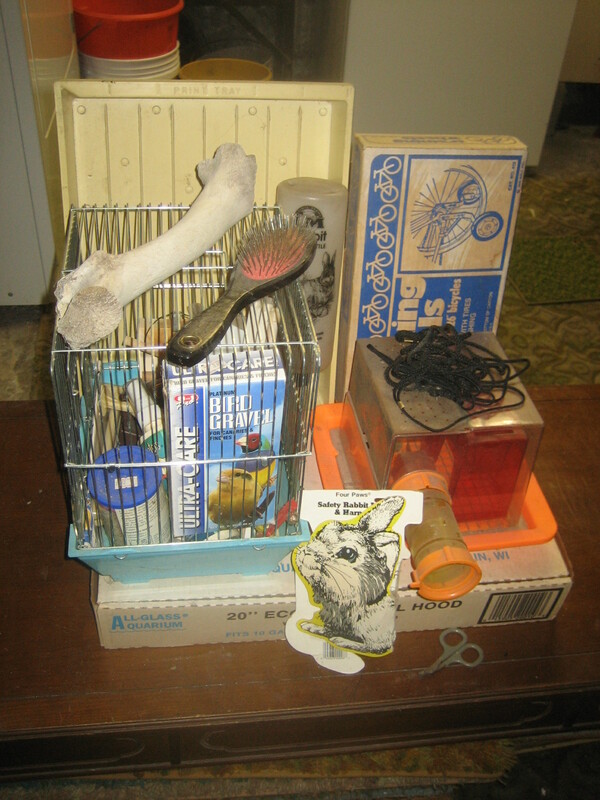 I’m also giving away a bird cage with supplies, a rabbit bottle and leash since we gave away the rabbit hutch years ago. Oh yes, notice the dried out bone on top of the bird cage. 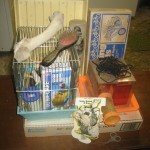 It’s not from one of our pets but I found it with the cages and it fit the title of this blog.